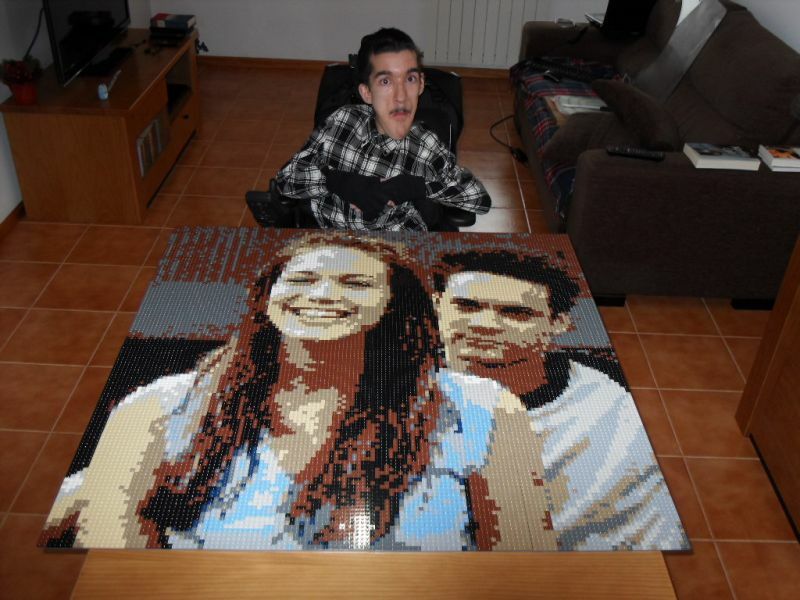 Hi, it's me the Mosaic guy again, this time with a Mosaic done by myself! When I finished my last Mosaic, which you may remember was from American Singer/Songwriter Kelly Clarkson, I started a new one I intended to have done by the summer of 2012. Unfortunately my University schedule messed things up a bit, and my motivation to do that Mosaic kind of vanished, so I stored it half done (I hope I can complete it in the next 3 or 4 months) and started a new one that I was really motivated to do, and that's the one I am presenting today. I am not going to bother you with much talk, because I made a blog to share the project (I hope it's ok to post the link) , a blog you can find at - http://www.awtrinbricks.blogspot.pt/ - it has the main page in English, but there's also a page in Portuguese, and even a page with a video for those of you who don't like reading. 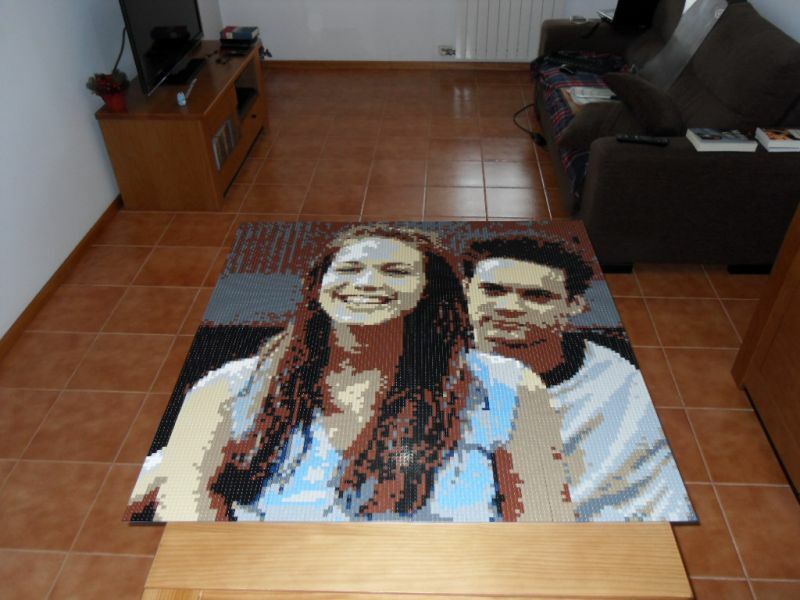 The content is pretty much all the same - there you can read about me and what led me to make this Mosaic, among the usual LEGO related specifications. 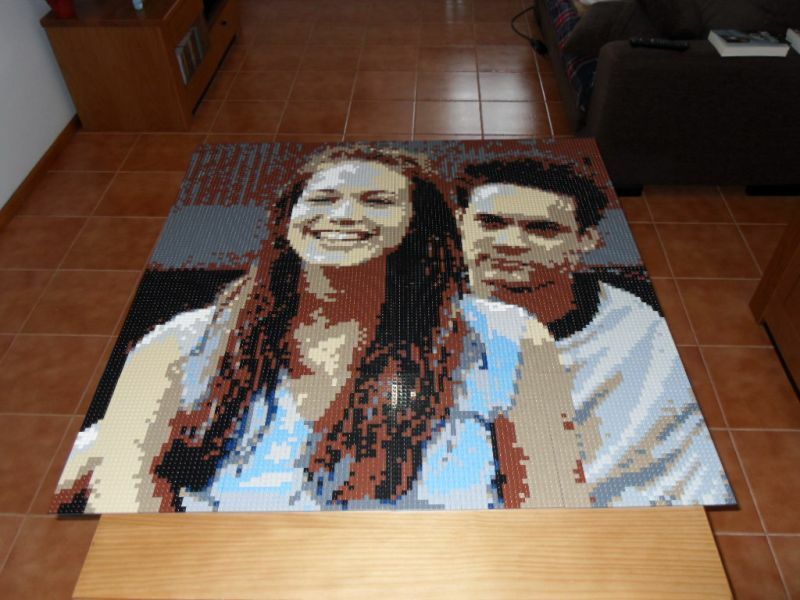 In resume, I made a Mosaic based on a promotional photo of the movie A Walk to Remember based on the novel by Nicholas Sparks, featuring the movie main couple - Jamie Sullivan and Landon Carter, played by actors Mandy Moore and Shane West. I am presenting it today because today, 25th Jan 2013 is the 11th Anniversary of the movie release on US Cinemas. Number of Colors - 10 - Black, White, Dark Bluish Gray, Light Bluish Gray, Very Light Bluish Gray, Reddish Brown, Tan, Dark Tan, Medium Blue and Dark Blue. I hope you all like it as much as I like it and liked doing it. I ask you one favour if your fancy doing it - share my blog! - Really, for me doing these things is not fun anymore if I can't share it with as many people as possible, be them or not LEGO enthusiasts. I really appreciate your collaboration. I just watched this movie about a week ago. Missed the beginning and title, but instantly recognized the guy and the girl in the picture. Checked it on imdb, yap it was that movie. Very well done! Very nicely done. I can see the likeness. I need to figure out hot to make a mosaic. I'd love to do a few of my own. Wow that is so awesome... I like that movie too! This is very impressive, even when one take's into account the amount of drugs someone would need to pump into me, in order to make me watch that movie. That is awesome. I have seen the movie several times, it is perfect!